Which Tekken Fighter Makes A Cameo In We Cheer 2? Oh, Panda does. 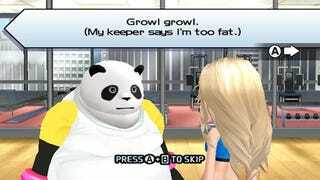 That mountain of an unlockable King of Iron Fist contestant finds some time to shed layers of hibernation fat in Namco Bandai's latest promotional attempt for Wii game We Cheer 2. According to an announcement from Namco Bandai, Panda's appearance in the Wii game will occur during the game's Workout Mode, a training option that "gets players moving to the beat as they land cheer moves to earn in-game Calorie Points." And if Tekken 6 is on your radar, then maybe you'll like doing some motion controlled cheerleading, or so I'm assuming the logic goes. Cute, but also a bit nauseating, as the clouds that emanate from Panda in the following clip should be recognizable to the Tekken faithful as more than just pounds of bear fat turning from solid to gaseous form. I'm amazed those two cheerleaders can withstand the stench.